WB SI/LSI Admit Card/ Call Letter 2018 Download: West Bengal Police Recruitment Board has scheduled the West Bengal Sub-Inspector/LSI excise examinations on 26th August 2018. Aspirants applied for SI posts 2018 and going to appear for SI written test can download West Bengal SI admit card from West Bengal Police Department website, policewb.gov.in. To attend the examination, admit card/hall ticket is the most required document. Candidate’s hall ticket will be verified at the examination center before allowing him/her to the examination. Hence candidates must carry the admit card while going to the examination. 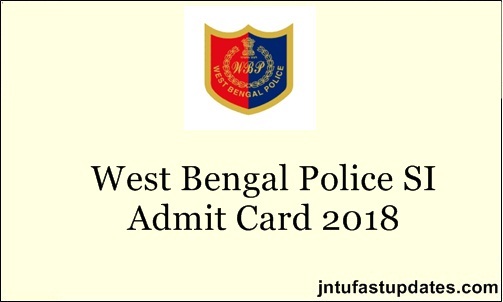 WB Police SI/ Lady SI Admit Card 2018 –The date of Preliminary Written Examination for recruitment to the post of SI & LSI of Excise under Finance Department, Govt. of West Bengal has been scheduled on 26.08.2018 (Sunday) from 12:00 Noon to 01:30 PM. The e-Admit Cards will be available on the websites of West Bengal Police (policewb.gov.in) and Directorate of Excise (excise.wb.gov.in) from 14.08.2018 on keying of Application Sl. No. & Date of Birth. All efforts will be made to deliver SMS alert to the registered Mobile Number of the candidates. However, the Board will not be responsible for non- delivery of such SMS. The candidates shall have to produce the printout of their e- Admit Cards at the allotted venues for appearing in the said examination. West Bengal Police Recruitment Board is the state level board that issues various police recruitment notifications depending on the requirement. WBPRB annually issues various job notifications to hire the suitable aspirants for various designations. The organization has recently advertised 1527 Sub-inspector vacancies. The vacancies announced are Sub-Inspector/Lady Sub-Inspector of Police (Unarmed Branch) and Sub-Inspector of Police (Armed Branch). Many of the hopefuls aiming to become Sub-inspector of Police in the state of West Bengal have applied for WB SI posts during the application dates. The WBPRB selects the suitable aspirants based on their merit and skills in various rounds of selection process. Applicants will be screened through various tests such as written test, medical examination, eyesight test and other tests. Hence aspirants who have applied during the announced dates will have to appear for the WBPRB SI written test in scheduled date. Before going to appear for the test, candidates have to download WBPRB SI Admit card 2018. The admit card will be accessible to download before 10 days of the examination (approximately). Candidates can get their admit cards from the official website, policewb.gov.in. Candidates applied for the West Bengal Police Sub-inspector vacancies have to attend the screening test on scheduled dates. Candidates those have applied for SI posts can Download West Bengal SI admit card 2018 to appear for the examination. Candidates can check the examination center, date and time of the examination and other details from the admit card. Candidates can check their name, date of birth, scanned signature, scanned photograph from the hall tickets. If any spelling mistakes appear in any column, they can approach the WB Police Recruitment Board helpline for necessary corrections. All the competitors going to attend the WB Police SI examination in December must carry the admit cards without fail. Also, candidates need to carry any valid identity proof Xerox copy along with hall ticket. The examiners are going to check the hall ticket and id card of the candidate. On the homepage, click on WB SI Admit Card 2018. I lost my application number,please help me to get the admit card because exam is on these sunday. Please kindly help me to download admit card. There are soo many complaint about to download the admit card. But no solution neither provided nor any information yet given by the competent authority in this regard. Same what to do how to get application SL number??? So can't download admit card because needed 8-digit application serial no!!!! I am facing the same problem and there is no other way to download. If you find any solution plz leave a comment.